Czech seed beads are more organic looking than their Japanese Seed Bead cousins. They are shorter than the corresponding sizes of Japanese beads, so you can string more of them per inch or centimeter. Their holes are quite a bit smaller, which has its good and bad points. If you are embellishing fabric with a single line of seed beads, beads with larger holes may wander around a bit because you are unlikely to use enough thread through their larger holes to really stabilize them in place. In contrast, Czech seed beads are more likely to stay close to the line of thread. 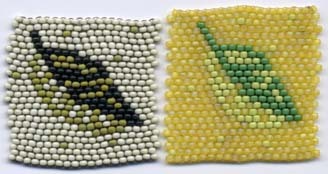 On the other hand, when you are doing beadwork that creates a surface that is completely beaded, the beads on either side help keep the big-holed beads in line. When you want to make multiple passes of thread through a bead, you are going to hit your limit a lot sooner with Czech beads than with the Japanese beads. Most of us have suffered the frustration of breaking a bead when we tried to get the needle through "just one more time." And we've gone a bit crazy trying to find new routes around a bead that is already full of thread. This type of issue comes up more often with Czech seed beads -- and it is even more likely with vintage European beads. The reason people love these beads is that their shape is beautiful. Kinda like a squashed globe. They seem to vary more in their height and you get more lopsided ones as compared to the Japanese beads. I personally love that feature, as I am always looking for a super-flat bead to slide into a tiny space, or a lopsided one to place along a curved line. If you are using them on a loom where each bead fits into a nice even rectangular space, you probably won't be as enthusiastic about this particular aspect. However, when we give the beaded swatches a quarter-turn, you can see that the Czech beads are noticeably flatter. In this case, 24 of the Czech beads match up to 22 of the 24 beads in the sample of Japanese beads. Your seed beads were made in the Czech Republic. Or in Czechoslovakia if they are are little older. The major manufacturer is Previosa Ornela, a.s. The Jablonex beads are made by this company, although they are now changing the name of their seed beads to Ornela or Preciosa Ornela. The Jablonex name came from the town, Jablonecs Nad Nisou, that has been the center of the glass business for many years. After World War II, a state-run export monopoly was established and it used the Jablonex name, so we have seen that name for decades now.